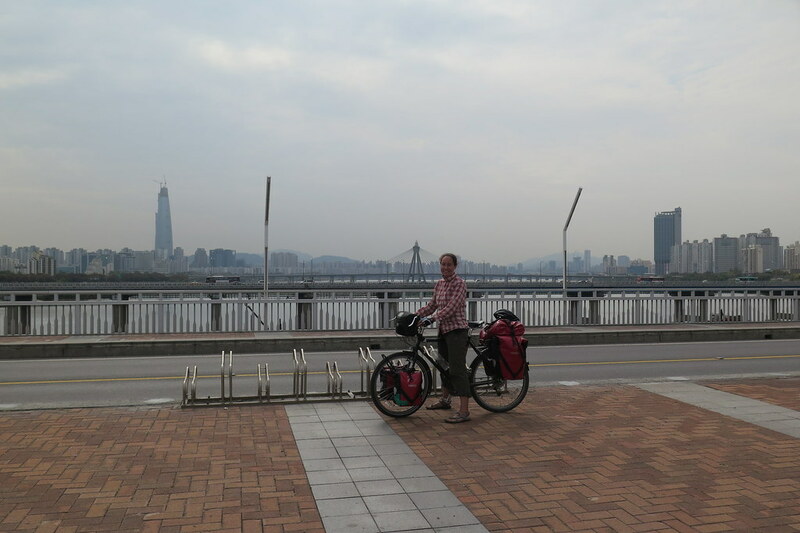 When we eventually left the hotel, we set off back towards the river to rejoin the cycle path heading north. We took it very easy, neither of us mentioning the tyre, but both obviously thinking about it and metaphorically keeping our fingers crossed. Speaking to other cyclists about this next stage of the route, they all spoke about the big mountain pass up ahead. Even without speaking the same language, the hand gestures for a big steep climb were very obvious. Heading up the valley, the peaks ahead started to tower around us. It was a beautiful ride though, with autumn colours in the trees and a clear sky overhead. 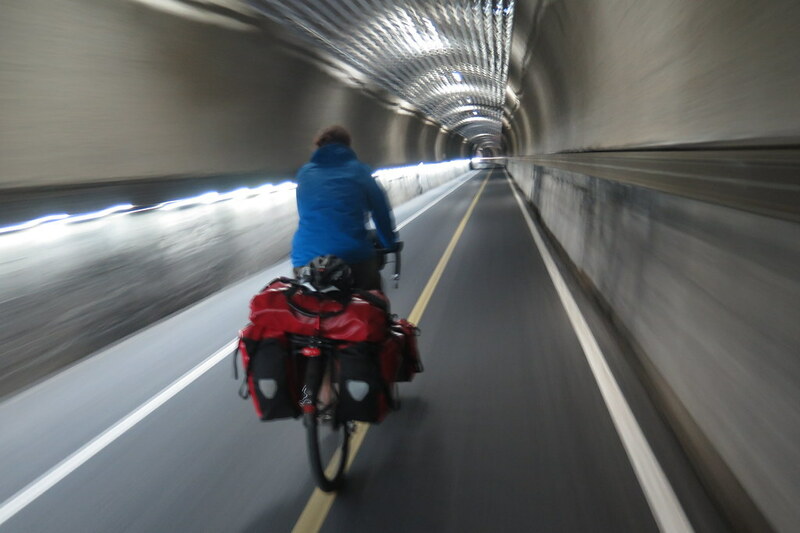 35 kilometres out of town, the cycle path joined a quiet mountain road that went up and over the pass. The road had split off from the main highway, which took the quick route and went straight through the mountains in a tunnel. At some point, we started climbing. 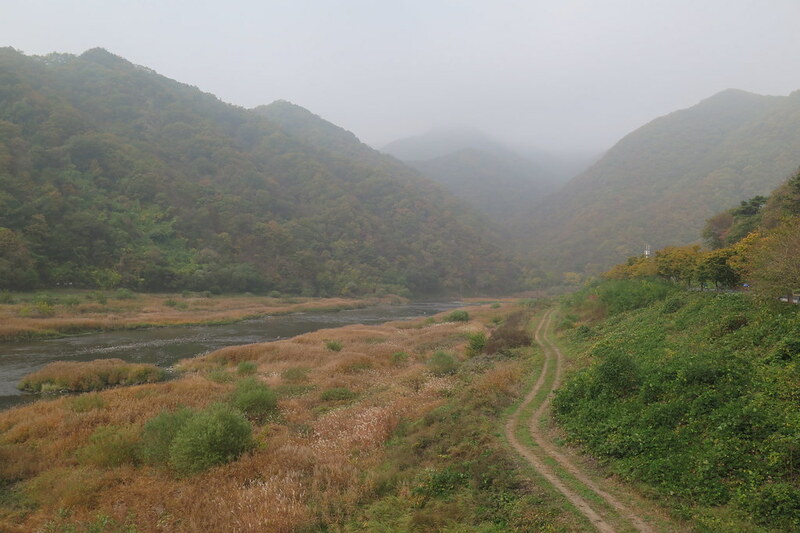 But compared to some of the ridiculous steeps we covered in the previous days, this was a mellow walk in the park. It was quite a long sustained climb, but the gradient was gentle so it was actually really enjoyable making our way up to the top. About a kilometre from the pass, we spotted two loaded touring bikes a couple of corners ahead of us. 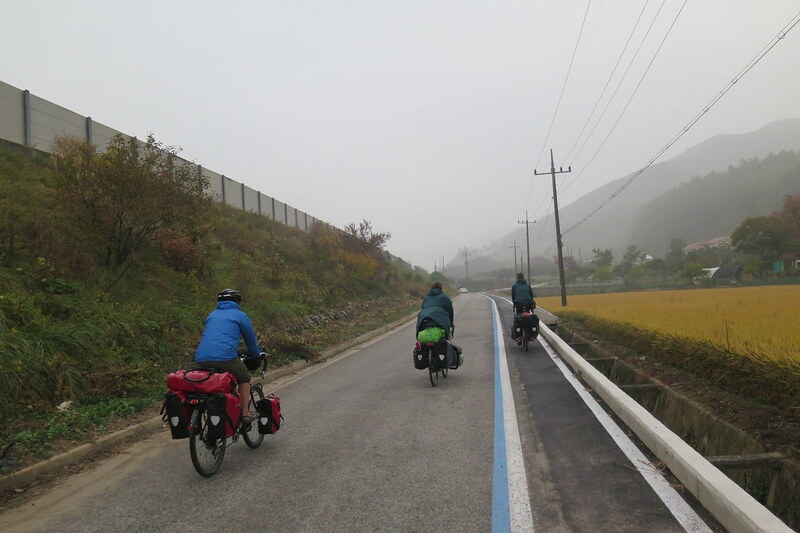 Since we arrived in Busan, we knew we were travelling in the same direction of another cycling couple heading through Korea and then heading west through China and beyond. Jorja and Dan, from Australia and Canada respectively, aka Jambi Jambi (www.jambi-jambi.com) set off from Tokyo back in September and are travelling around the world over the next 3 years. 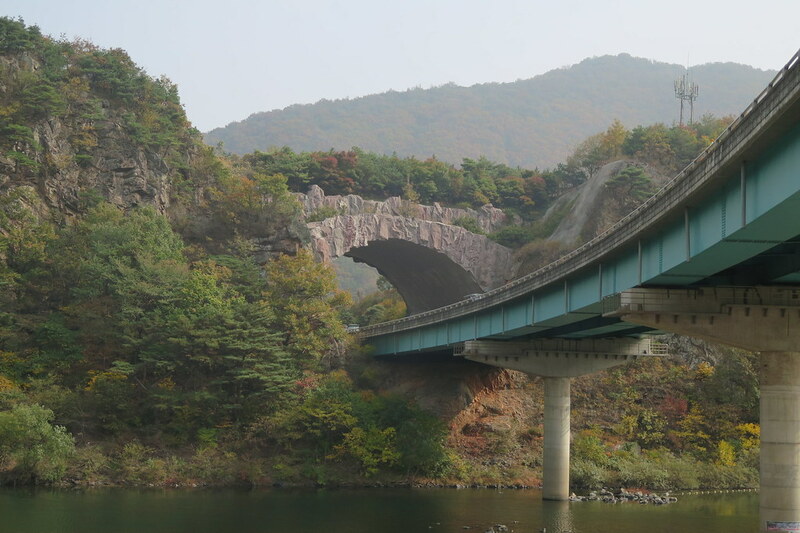 We’d exchanged messages on Facebook and were sure we’d meet up somewhere on the route to Seoul. We closed the gap and yelled ahead to them, then rode the rest of the way to the top breathlessly exchanging greetings. We grabbed a few beers and sat in the small cafe on the pass and chatted about cycling and our plans for the coming months and years. 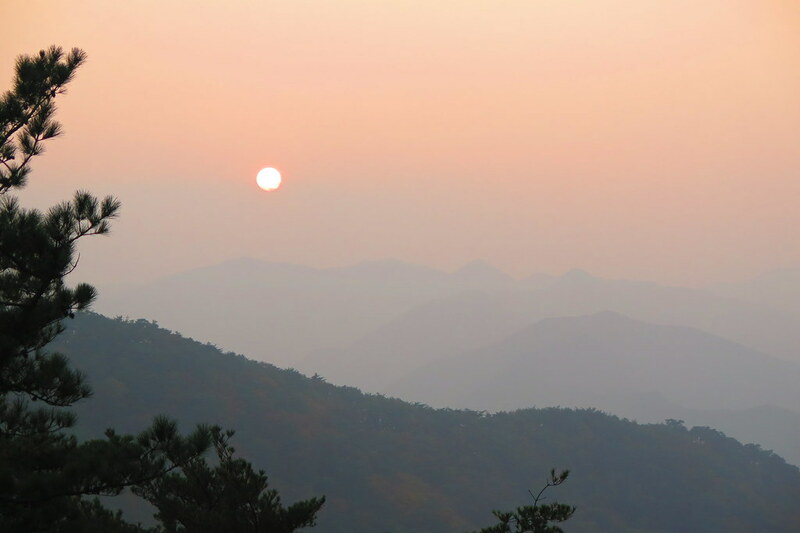 The sun was setting over the mountains so rather than head down into the valley, we decided to stop for the night in a covered pavilion. Dan and Jorja were great company and inspiring in their creativity in documenting their lives and travels. 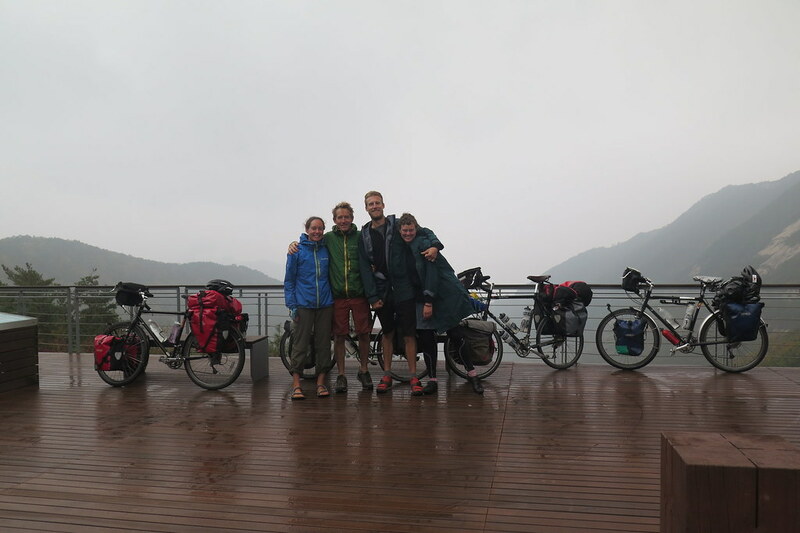 We cycled with them for the following couple of days before they needed to push on ahead to get to Seoul to arrange their onward visas to China. Our camp spot that night overlooked the valley and the highway disappearing into the mountain below us. It was peaceful, if a little cold, and we expected to sleep well. Until the animal noises started. We heard rustling in the undergrowth around the pavilion and the odd grunt. We’d seen signs in the valley for the weird goat/deer creatures that are known in Japan as kamoshika, (not sure of their English name, if they have one) so assumed that’s what we were hearing. In the early hours, we were curious to see one of these elusive animals, so we got out of the tent and cautiously walked down a path shining torches into the bushes. The shadow that waddled across our torch beam turned out not to be a kamoshika, but a wild pig. It wasn’t huge, but we’d heard about these wild pigs with their big teeth and aggressive nature so we turned and ran back to the safety of our tent on its elevated platform. Enough wildlife for the evening. The following morning we’d hoped for a sunrise over the valley, but we woke to drizzle. 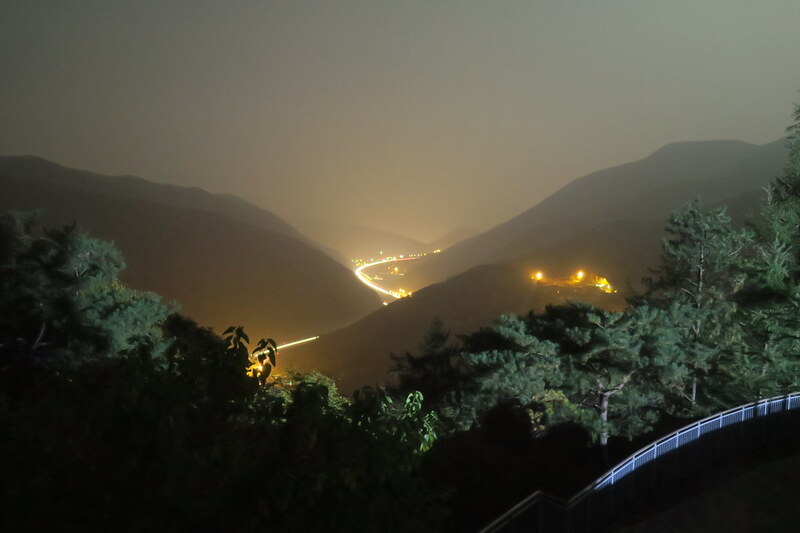 So far the weather in Korea has been perfect and this was our first rain in over a week so we couldn’t complain. We dug out our Montbell Goretex jackets knowing that we’d be warm and dry for the morning’s cycling (plug plug). It was great to start the day with a nice long descent. 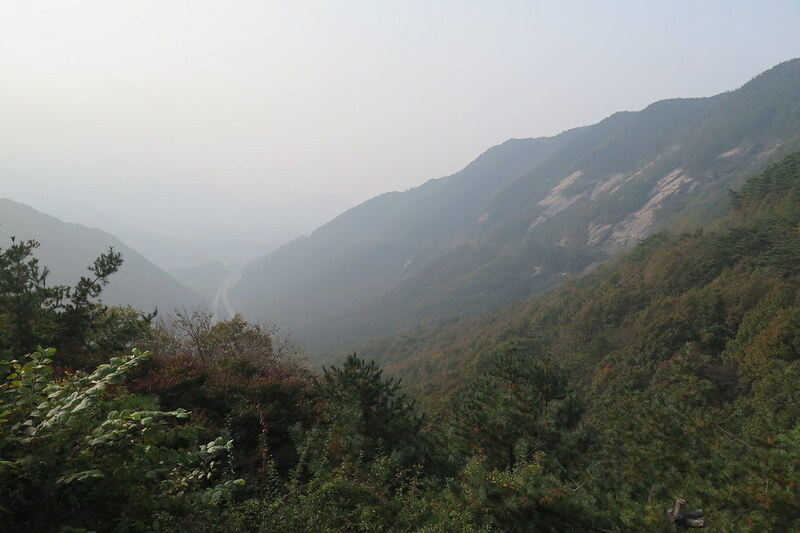 The clouds hanging on the ridges and flowing down into the valleys added to the wildness of the scenery in a way. 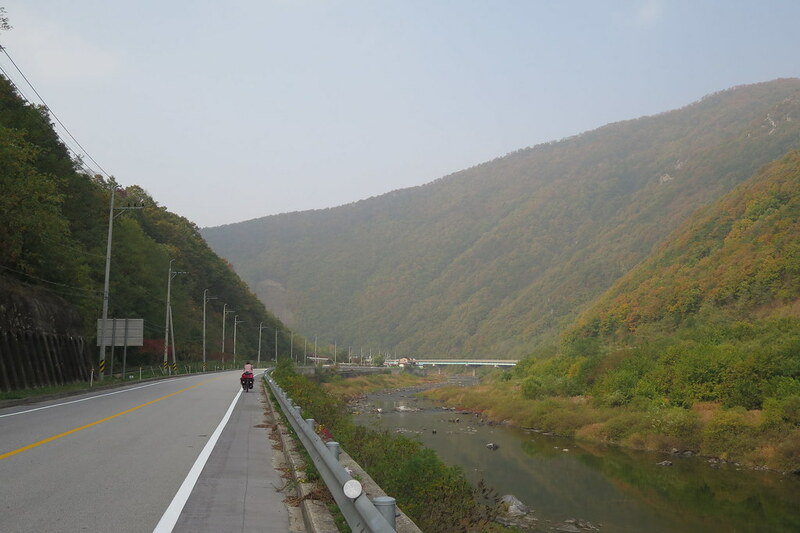 Although not particularly tall, these Korean mountains are jagged and angular giving a spectacular backdrop to the valley we rode down into. 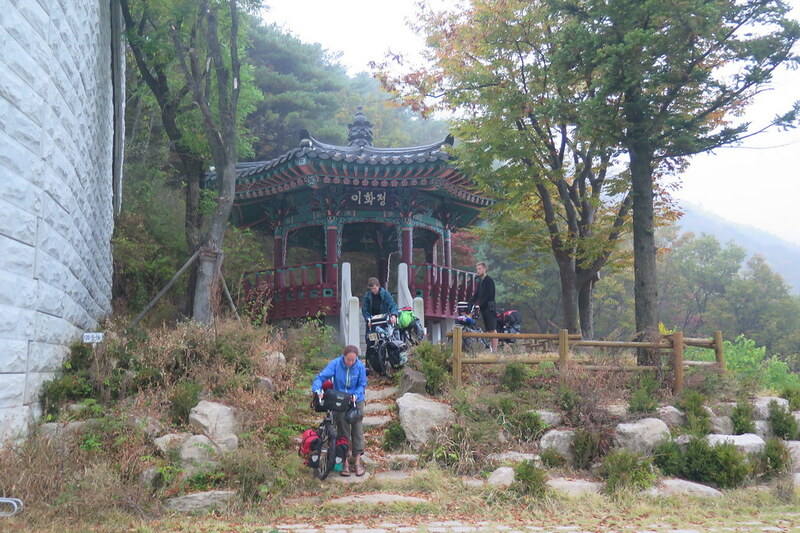 The clouds cleared through the day and we rode at a leisurely pace with Jorja and Dan for about 80km. We stopped at a small drinks/bike maintenance building next to the river in the late afternoon for and ice cream and looked at the map for potential camp spots ahead. Nothing obvious presented itself, so we were a little unsure what we’d do. We spotted the building had a large flat roof, so we asked the owner if she’d have a problem with us pitching our tents up there. She looked concerned and said wouldn’t we be cold, and what about having a shower (must be getting smelly again), but it’d be fine if we wanted to. Perfect! We had a huge flat area, completely hidden and safe. We cooked our dinner and had another great evening with a few beers. Travelling with another couple has been great for the company, but the budget took a hit from the extra beer and snack expenditure! 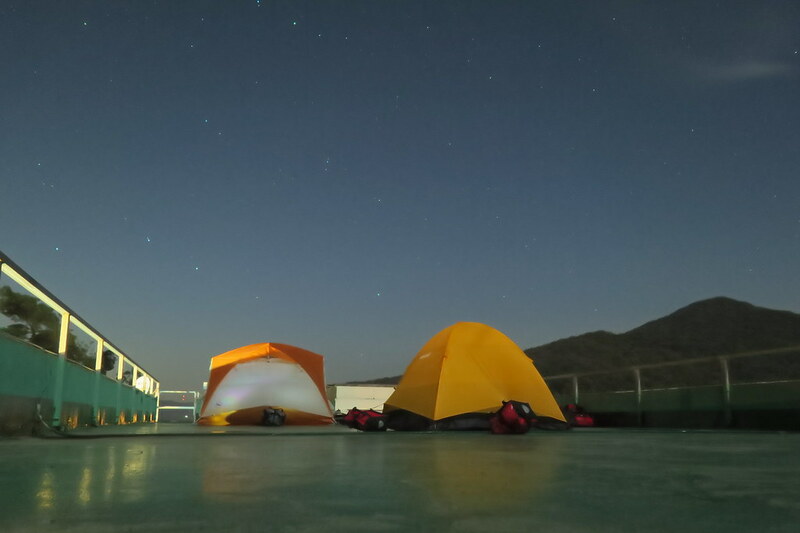 The following day, there was another solo cyclist camped in the carpark below us. We’d heard him arriving late the previous night and asking in English if he could camp. Jorja called down to him and got him up onto the roof for breakfast and coffee. 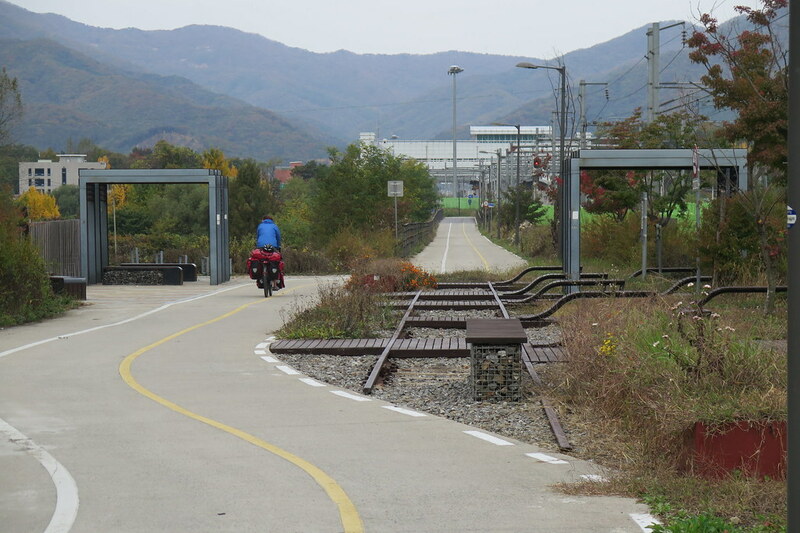 Haniff, from Malaysia had also cycled from Busan and was heading for Seoul. He was riding a light road bike carrying a small tent and minimal gear so was making much quicker time than us. But he joined the crew and rode with us. 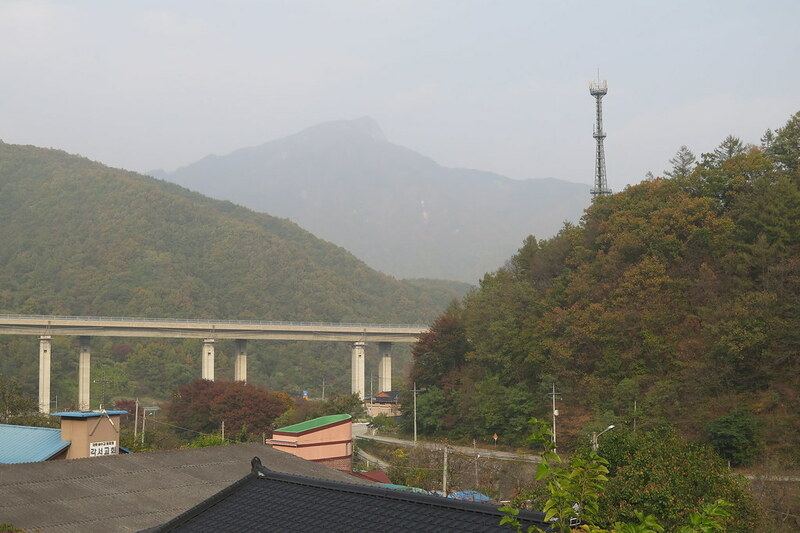 By lunch time, we were getting out of the mountains and within striking distance of Seoul. 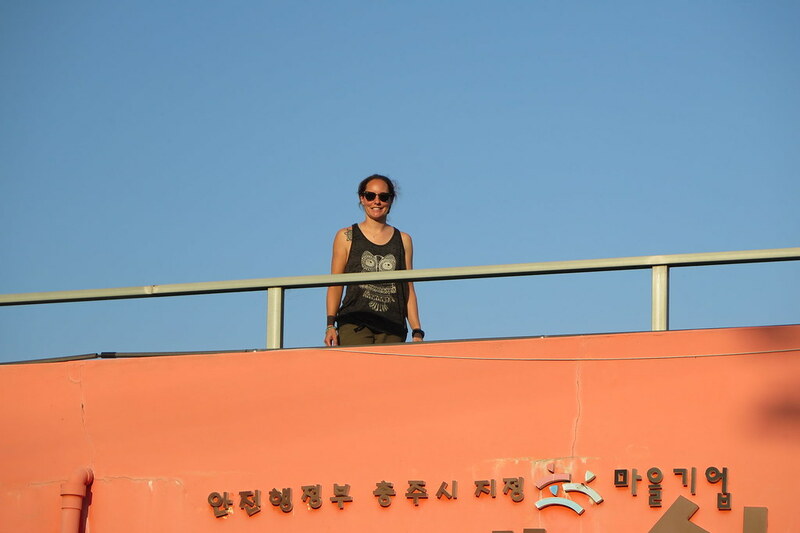 After a long break to dry our tents and generally lazy about in the sunshine, Jorja and Dan decided they’d push on with Haniff to get to Seoul a day early to arrange their China visas before the weekend. They’re using an agent and it seems like they’ll be able to get a 3 month multi entry visa. We only got a one month visa applying through the visa centre in London, so in hindsight we probably should’ve waited until now to apply. We continued just the two of us for another few hours to get us within 45 kilometres of the city. We camped in a park area next to quite a busy dual carriageway, but the road noise died down through the evening and we slept really well. 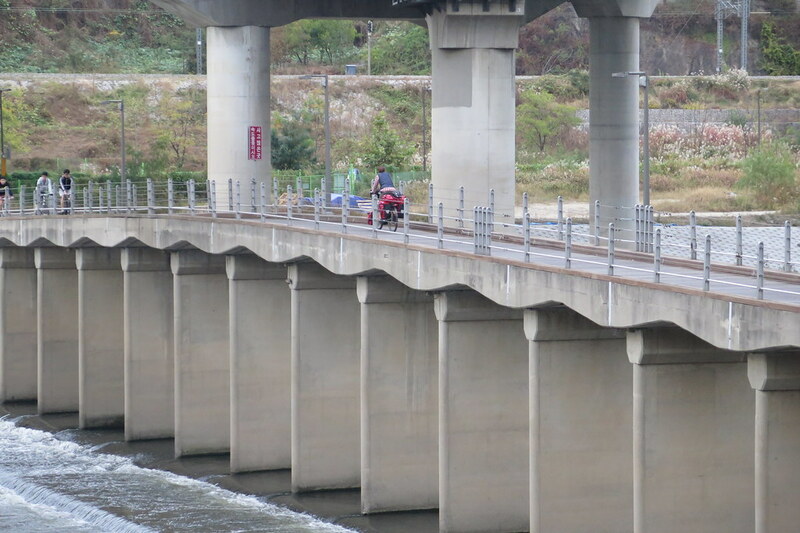 The final stretch in Seoul was an easy ride and we weren’t in a hurry. We weren’t exactly sure what we’d do once we arrived as we have until the 31st before we plan to take the boat to China. We followed the course of an old railway line, through tunnels converted for the cycle path. 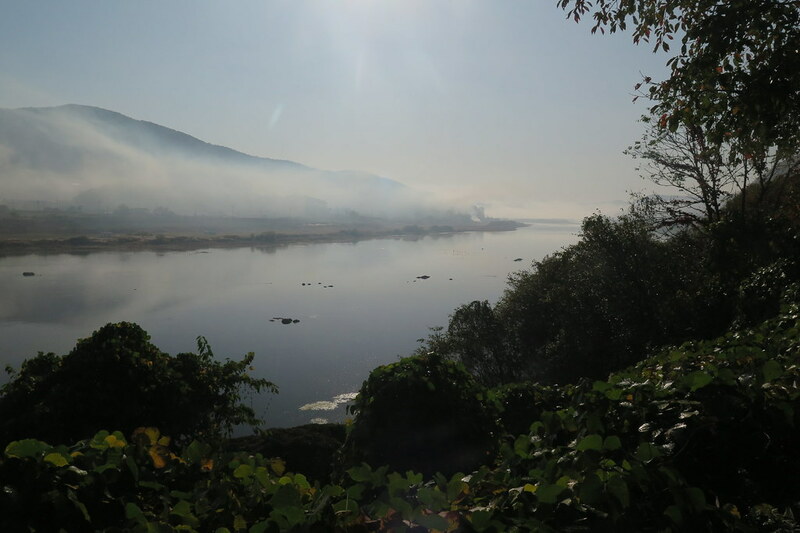 Through the morning we saw helicopters circling overhead and as we got closer, we saw they were dropping parachutes then swooping down to collect them. 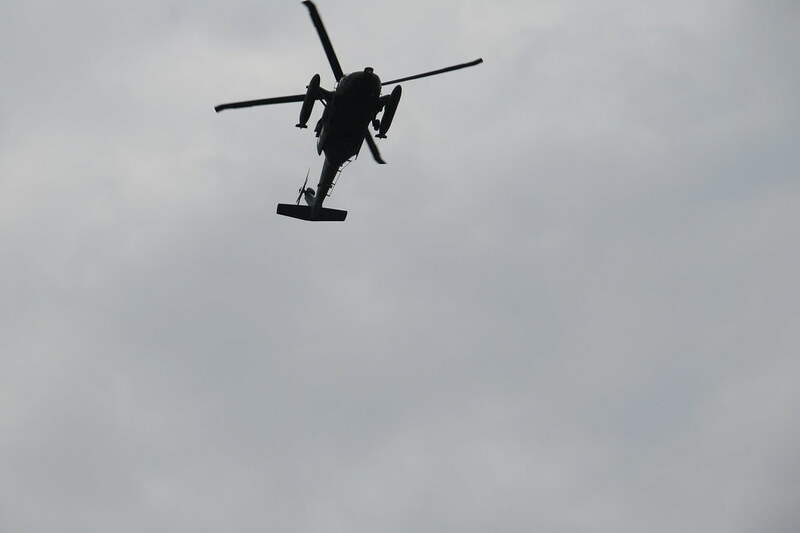 The path took us right past the drop zone so we had large military helicopters buzzing us for a section of the ride. We’ve seen quite a high military presence here, with lots of fighter aircraft patrolling and large barbed wire fences and guard posts dotted around the place. A reminder of the tensions with South Korea’s neighbour to the north. The cycle path took us right into the centre of the city. 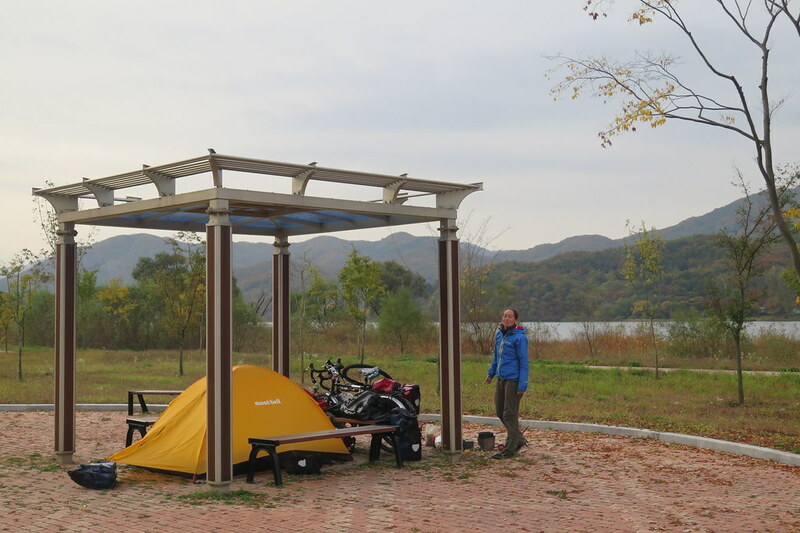 Discussing our options, we decided we’d leave our bikes in Seoul and then catch a bus over to the east coast to do a couple of days hiking in Seoraksan national park. Luckily, we have a friend here, Kung, who we met when he stayed with us in Hokkaido through Warm Showers. We had already planned to stay with him on the 29th but contracted him again to ask if he wouldn’t mind storing our bikes for a few days while we went off east. This was no problem at all, but he also insisted that we stayed with him that evening too before we caught a bus the following day. His place is really convenient to get to via the riverside cycling paths so we made our way up there, via a skatepark to test the freestyle capabilities of our loaded Long Haul Truckers (surprisingly nimble). We met him when he finished work and he welcomed us into his top floor apartment overlooking the city. We also met his new wife, Hyo Hee for the first time. Happy Wedding Anniversary to you both for November 1st! 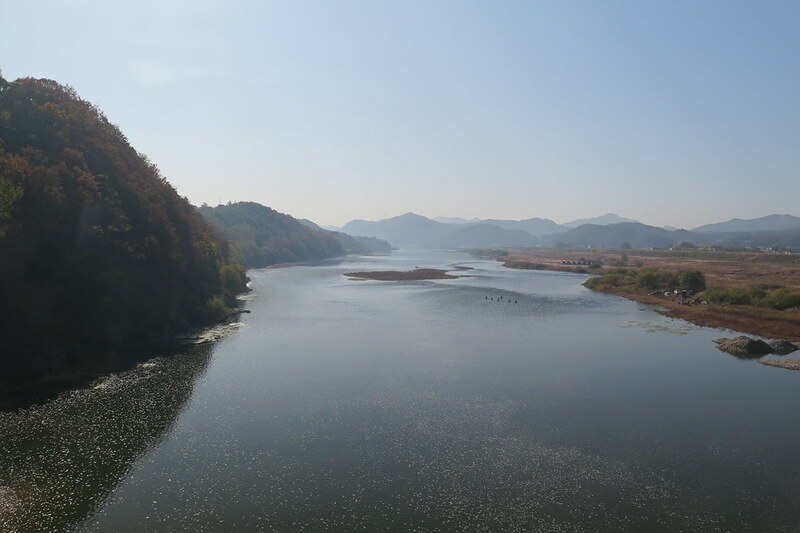 Kung has also helped us to arrange our ferry tickets to China, as well us giving us loads of useful info about travelling in Korea. Another top man who’s really helped us out on this trip! 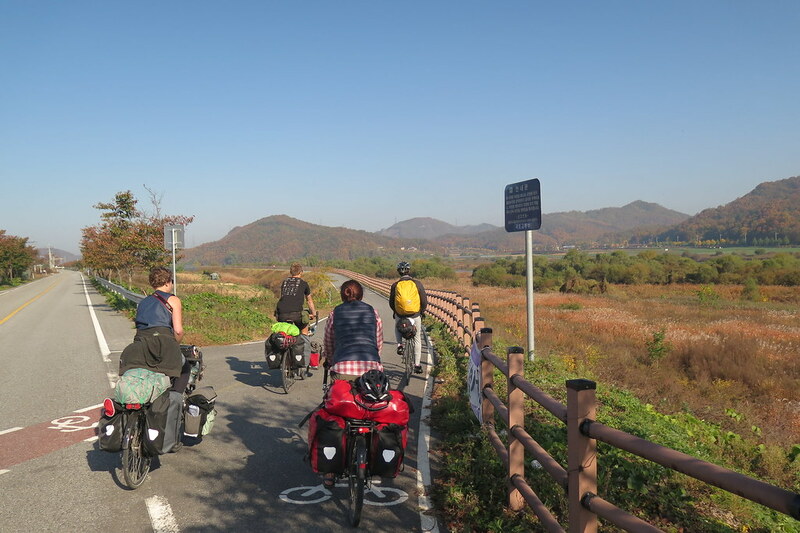 With our panniers and bikes safely stored at Kung’s, we headed down to East Seoul bus station to catch the bus to Sokcho city for a few days out of the saddle. 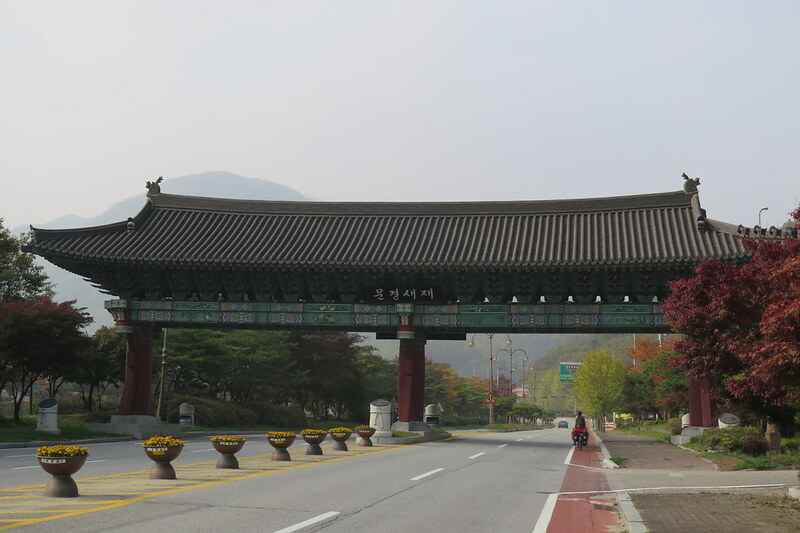 Once we’re back to Seoul, we’ll just have the short ride out to Incheon port. That’ll get us to where we’ll catch the boat, and of course get us our final 3 stamps that we need to complete our cycling passports! Another great blog. So glad to hear you’ve (hopefully) found the tyre problem. Have lots of maintenance-free miles. Sounds like things are going great for the two of you! 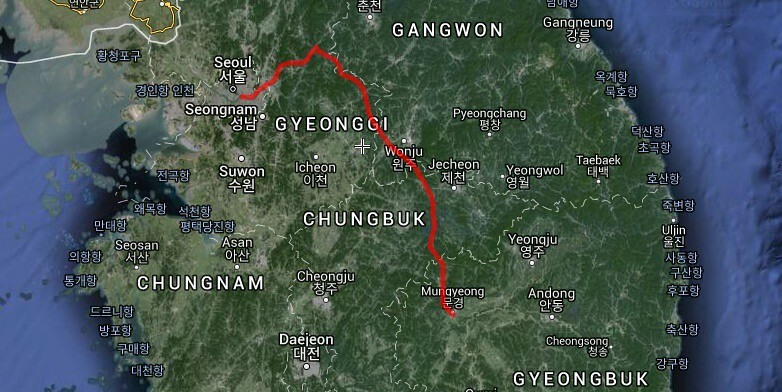 And you are really making us want to get over to Korea for some cycling. Have fun in China!